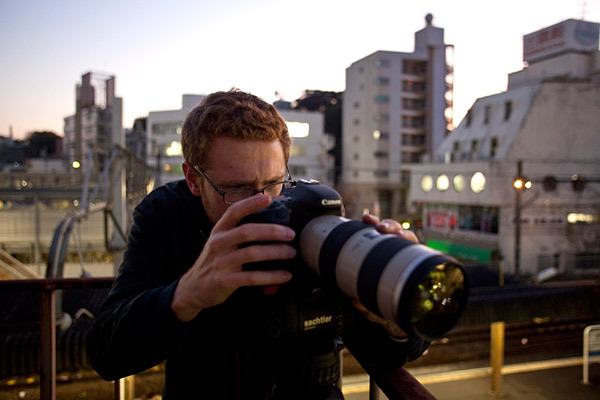 Andrew Watson puts these cameras through their paces while shooting films in China and Japan. My first experience with the Canon 5D Mark II came when working with cinematographer Robert Humphreys on a PBS documentary. Up to that point, I had written off the 5D due to the lack of manual controls and didn’t give it serious credit. On the shoot we had two cameras, a Panasonic HDX900 with a P+S Technie Pro35 adapter and the Canon 5D Mark II. Our task was to shoot as much B-Roll as possible in Grand Central station to help illustrate the theme of emotions for a NOVA episode. Unfortunately we ended up with a gloomy day and the brilliant light Grand Central is known for just wasn’t there. Our original plan was to work with the HDX900 as much as possible, but it became apparent there was simply not enough light for that camera. Instead of using the $50k camera, we opted to use the $3k still camera to shoot a majority of the footage. From this experience I quickly realized the power of the 5D Mark II. Shortly after Canon came out with the manual controls update and that was enough for me to jump on the bandwagon. Many have echoed my initial reactions to the 5D II so I won’t go into much detail. The things I disliked included lack of audio controls, professional audio inputs, a fixed positioned LCD screen, lack of variable frame rates, etc... The stunning images it produced, however, allowed me to overlook those problems. The first major project I used the 5D II on was a feature documentary shoot in China. Once again we had a larger camera, the Panasonic HPX200a with a Letus35 adapter, that we used for a majority of the project. We shot all the interviews and main footage with this set up. We chose to use the 5D II for establishing location B-Roll and low light situations where sound was not an issue. The 5D II worked out incredibly well as a secondary camera. The small size and inconspicuous look worked great when we wanted to fly under the radar. We did not have permits to shoot in Beijing, but we managed to get all the location shots we wanted without any hassle. The lowlight sensitivity also helped us shoot in dark spaces on the fly. Due to the rolling shutter - a single sensor that records the image from top to bottom versus the typical three sensors system in a broadcast camera - you can get a “jello effect” if too much movement is introduced into the frame. Because of this, I found the best results came from shooting on a tripod and limiting handheld camerawork. For steady shots and smooth pans I used a Schalter SB6 MD2 tripod. It can handle larger cameras around the 12-to-15-pound range, but also worked well for smaller DSLRs. The SB6 head is pricey, around $1,500, but a smooth fluid head is essential when shooting video. I only used a handful of lenses in China, which included the 17-35mm f2.8, 50mm f1.4 and 200mm f2.8. I bought off fellow sports shooter Brian Balanco, thanks Brian. I mainly chose the 200mm prime because I wanted to travel as light as possible. 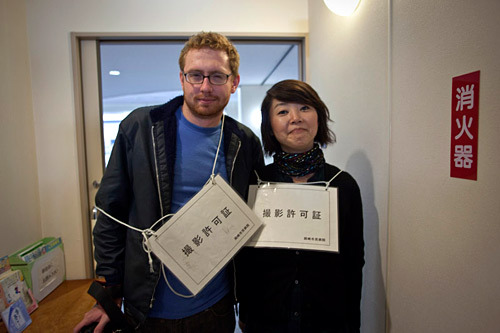 Andrew has had to wear some funny press passes in the past, but nothing compared to this! Its a terrible picture of him, but he just had to share. Next to him is his local producer Satimo. On the 50mm I had a three-stop ND filter which helped me keep my F stops as low as possible, but at times this was still not enough to get into the F-Stop range I would have liked to be in. The lack of built in ND filters is a huge draw back to current DSLR cameras. The ideal solution would be to have multiple ND filters for each of your lenses, but due to the different thread sizes, this is a pricey option. After working with the 5D II in China I concluded that it was a wonderful “B camera”, but was still undecided about using the 5D II as the primary camera. However, the extra flexibility and size of it made it a wonderful addition to my camera bag. While I was working in China, Canon announced the 7D. The major advantage to it is the inclusion of 24 frames per-second. This new option not only allows for a more cinematic look, but also makes it much easier to mix the footage in post with other cameras that also shoot at 24 fps. Despite this upgrade, the 7D still had the same issues as the 5D II - lack of audio controls, input options, etc... While the 7D was temping, I decided against switching mostly due to the lack of a full frame sensor. I was hired in In November to shoot a documentary project in Nagoya, Japan. The director, Anthony Gilmore of Nameless Films, owned a Canon 7D and wanted to shoot a portion of the project on the camera. After arriving in Japan and scouting out the locations, which included a lot of dark spaces and uncontrollable light, we decided to shoot the entire project on the 7D. Working with the 7D was very similar to the 5D II, although now we had the challenge of recording sound. To make things tougher, the project was to be shot cinéma vérité style, with no formal sit down interviews. We decided to employ the old-school double system approach, meaning we would record picture and sound separately. We used a Zoom h4 for the sound recorder and rented a Sennheiser Mk416 shotgun mic -I have to double check this, but it may have been a higher end model - and also had a Sennheiser g4 wireless system with a Tram TR50 lav mic. We had the advantage of having a four-person crew, a director, producer, sound guy and myself, the cinematographer. We did not record sync sound on all the takes, however, when we did we would typically roll on the 7D until it shut down due to clip size limitations. The key to this system was organization. Every time we finished a few takes, the producer would take the memory cards from the camera and the Zoom and copy them to the same folder. This system worked out beautifully, but if you were working alone this could be difficult. If you were recording a few interviews I think this system could be used by one shooter, but if you needed to shoot a lot of content, this system might not work. Another important piece of gear I had was the Zacuto Z-Finder. The Zacuto Z-finder turns the LCD screen into an eyepiece. There were a few major advantages to using this piece of gear. First, it added another physical point to brace the camera, which made handheld shooting much easier. Second, it is crucial to have if you want to shoot in bright sunlight. While the Z-Finder is a great piece of gear, I did feel it strained my eye much quicker then the viewfinder on a broadcast camera. For lenses we used the same set I shot with in China, with the addition of the 17-55mm f2.8 IS and the 70-200mm f2.8 IS. Due to the amount of handheld shooting the IS became critical. The 17-55 is definitely not as sharp as my 17-35mm, but the IS helps so much I looked passed it. Whenever I was on sticks I chose my L series lens over the ultrasonic, but when I was shooting handheld I used the IS. After working with the 5D II and the 7D I’m still happy to own a 5D II, especially with Canon’s announcement for a 24 fps firmware update coming sometime first quarter of 2010. The 7D looks great, but I did seem to notice grain at a lower ISO. The 5D II holds up well for broadcast until ISO 800, while the grain appears on the 7D around 640. This is purely from my experience and not through camera test. The other reason I still prefer the 5D II for both for video and stills is the full frame sensor. It's really painful to put a 17-35mm on the 7D and lose such a beautiful wide shot. While neither the 5D Mark II nor the 7D are ideal substitutes for a video camera, the amazing images they produced make up for it. If you need to shoot hours and hours of video with sync sound then the workflow to these DSLRs still might not be realistic, but if you have some patience or the extra resources Canon’s 1080p, DSLRs are a great option. The minute Canon comes out with a DSLR that has XLR inputs, manual audio controls, headphone jack and multi frame rates, I’ll sell off my broadcast camera package.